Ducati.ms - The Ultimate Ducati Forum > Ducati Motorcycle Forums > Supersport > Forced restoration of 900SS after finding crack in frame. Forced restoration of 900SS after finding crack in frame. Old rider and County Fair like this. Last edited by Combi245; Mar 19th, 2015 at 2:50 am. Sounds great. This is a good reminder to all to check for cracks periodically, and if you find one take care of it. Bike has been completely pulled apart and the frame is now sitting on the shop floor. Closer inspection of the crack has revealed that it is far worst than I first imagined. From what I have seen only one more decent bump would have resulted in the frame completelty failing. I have devised a repair scheme for the frame which will see the removal of the triangulated tubes from the top head stem area to the lower tube to gain access to the vital areas that need to be repaired before I can start the delicate process of removing the tank bracket/brace from the top tube. The cross brace tubes will be part of the replacement process as I am not impressed with the way they have been installed in the first place. I am now waiting to here back from a couple of companies in regards to 4130 prices which are wildly different around New Zealand. Picked up some S70 tig rods the other day specifically for the repair and the TIG welder has a new argon bottle fitted to it. There should be no hold ups on that front. "Home command" is less than impressed with the bike - she even passed the comment that I should have bought a Harley - shame on you Ducati, you should have fixed this problem properlly when it first became an issue. I am surprised that noboby in the US took them to court to force them to do a product recall and replacement of all frames back in the day. There are plenty of other examples of this happening for far less serious product recalls. Last edited by Combi245; Mar 18th, 2015 at 5:40 pm. I am surprised that noboby in the US took them to court to force them to do a product recall and replacement of all frames back in the day. I hear that, loud and clear! It seems like enough of a safety issue to warrant a recall to me. After all, infant carseats get recalled when the buckle release button might get sticky and be difficult to operate. Not when the buckle is prone to cracking and failing, just hard to push! Can you post a pic of the crack? The frame material is not 4130. The repair manual says it is chromo but its just mild steel. ]After a lot of swearing and cursing managed to get the bracket out of the frame with the use of a sabre saw and a heavy duty blade to cut it out. 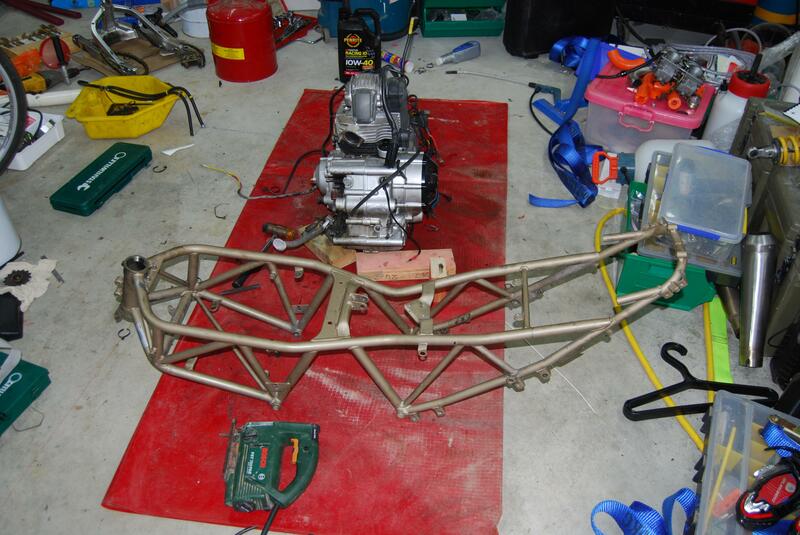 Will remove the two smaller frame tubes tomorrow and do some measuring and testing to see what material the tube is made from with the help of my Aircraft metal working mates. I have left the bearing races in there positions within the head tube to give the top of the tube a bit of protection while I work on it - the bearings need replacing anyway. As for the engine, I had a good look at the ports and everything seems to be in excellent condition, all the ports are pretty clean as well as the backs of the valves - no signs of any oil going down the side of the valve guides. One thing I did note though was that the port has had some pretty ugly cleaning of the intake port runners from the factor. It looks like the have machine the port off centre and then blended it out by hand. Have plans to get the heads CNC machined ports and manifolds, new VeeTwo high torque cams with matching longer valves , new valve guides, twin spark plug conversion and all the other bits and pieces for the heads. Last edited by Combi245; Mar 19th, 2015 at 2:48 am. I keep hearing different things regarding frame material. I've heard that it is mild steel before and from other sources that it is indeed chromoly. Pajazo, can I ask how you confirmed this? And Combi, I'll be anxious to hear what your aerospace friends say as well. Looking good so far. It is concievable that parts of the frame are constructed from different grades of material based on the percieved loads that they are subject to. 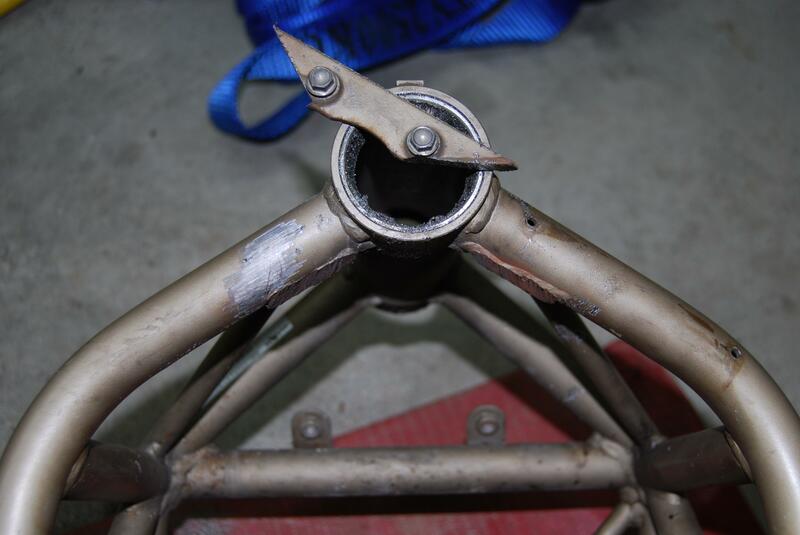 For example I would not expect the brackets that are the mounting points for the fairing to be made from CrMo steel as they get damaged pretty easily if the bike falls on its side. However the tubes that it is fitted to need to be alot more resilient and I would expect them to be of a stronger grade of material given that the tube wall thickness is so thin. In effect I would expect the main parts of the frame to be of a much greater tensile strenght then the parts of the frame that may be subject to random lowlevel accident enduced damage - a sacrificial or redundancey element. The guys are looking into how we can determin if it is Cromo steel - at this point it looks like we will have to do a deflection test of the bits that I remove and see if they are what we think that they are. Either way, its going to be fixed once and for all and I will be making some additonal replacement brackets up for future use - it would appear that I am getting more and more people coming to me for work to be done on there bikes with a potentially similar issue. Have managed to remove the two small tubes from the frame with the minimal amount of fuss with a combination of the grinder with a cut off wheel and the sabre saw. Decided that it was safe to proceed with the grinder to clean the welds up and got into when all of sudden there was a cloud of steam. I found another problem in the frame - the tube connection to the head stem on one side was never welded completely. 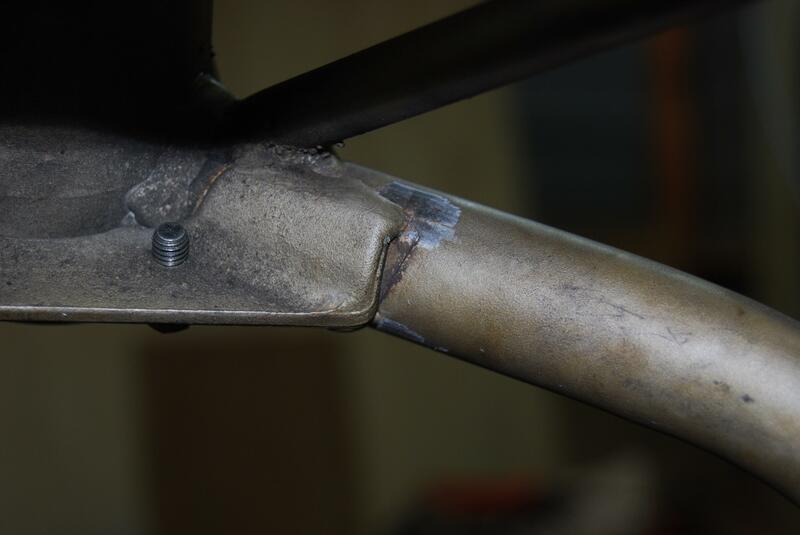 There was a small gap where there was no weld at all which had allowed water to track under the gusset through the gap and into the top frame tube. 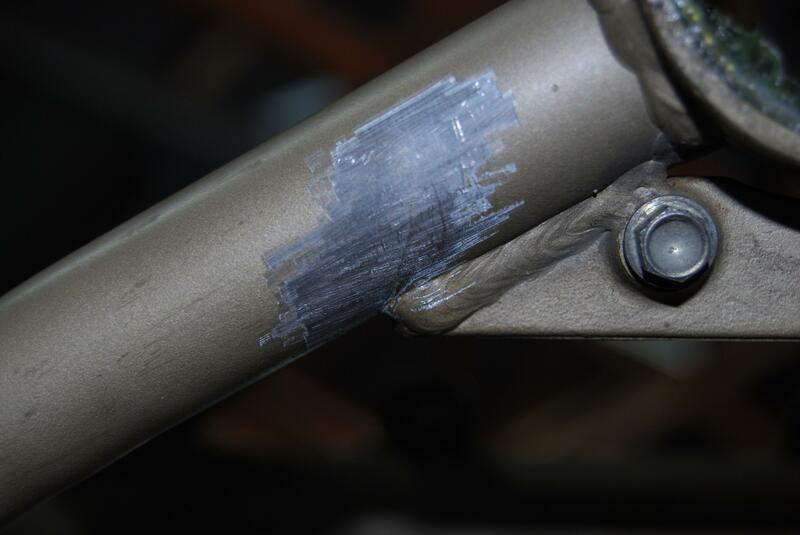 The crack had extended length ways down the pipe, travelling down the edge of the weld back towards the head stem as well as around the tube. From what I can see with the sparks that come off the grinder though, they appear to be very different to those that come off a piece of mild steel. I can only conclude that the frame is made from something other than mild steel.